Everything changes in this world. We all try to preserve memory of the past. Modern technologies, such as digital photography, help this memory preservation very much. Quantity of photos that are made on photographic paper from year to year decreases. We review most of the photos on the PC monitor, on the screen of our phone etc. Representatives of the digital industry could not lose this trend and thanks to this were born special devices for comfortable viewing pictures – digital photo frames that look like an ordinary photo frames. Hints about how to choose the most effective digital picture frame will be discussed in the present article. 2. Format and display resolution. 3. Viewing angle and brightness of the display. 5. Video and audio support. A digital picture frame (electronic photo frame) is a device that designed to display digital images which are stored in its memory. Photos are the most common type of these images (hence the name), although photo frames can display any image which format is supported by device. The name “picture display” is used instead of the name “photo frame” sometimes. Ordinary paper photos have their standard sizes, such as 9×13 cm or 10×15 cm. Electronic frames have their own standard sizes too. Screen (display) is the main part of the device, so the sizes of photo frames are classified according to its sizes. The standard frames sizes are 7, 8 or 10 inches most commonly that is equal to 17.8, 20.3 and 25.4 centimeters respectively. There are also non-standard sizes, such as 5 (12.7 cm) or 9 inch (22.9 cm), and “large” size (i.e. 17 inches), but they are used less frequently. Big digital photo frame can be used for promotional purposes and small in order to carry it in your pocket or bag. Picture frames size selection is actually a matter of taste, someone likes to watch big pictures, and someone will be sufficient to 7 inches. 2. Frame format and display resolution. You need to pay attention to the format of the display in addition to its size. Formats of photo frames are defined as follows: if device sides ratio is 4:3 it is a standard display, if the ratio is 16: 9 (16: 10) it is widescreen (slightly elongated). It is believed that widescreen display broadcast more realistic picture, though, in my opinion, this is also a matter of taste. You can buy a widescreen picture frame only if you have photos made by widescreen photo objectives cameras. Display resolution is also an important parameter of photo frames. Display resolution indicates how many dots (pixels) placed on the screen horizontally and vertically. 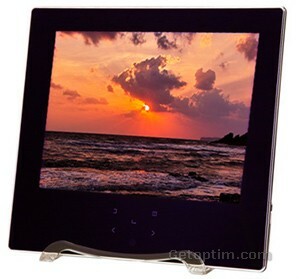 Simple frames with 7 inch screen have resolution of 432 x 234 pixels. More expensive 7 inch digital photo frames have a resolution of 480 x 234 or 800 x 480 pixels. Most of 8 inch picture frames have a resolution of 640 x 480 or 800 x 600 pixels. 10 inch frames can have a resolution of 1024 x 600 or 1024 x 768 inches. Resolution value determines the sharpness of the image. Viewing angle is a corner where you can still see the picture on the screen. The greater viewing angle is better, because you can see the photos not only in front of the device, and also a little from the side or from below (above). A good indicator is viewing angle of 160 degrees or more. The image quality also depends on the brightness of the display. Photos will be displayed better when brightness is higher. 4. Number of supported image formats. Digital images can be stored in different formats. It is good if the photo frame can recognize many of these formats. Standard set includes “understanding” of JPEG (JPG) format. Many devices can to understand BMP and GIF graphic files formats in addition to his. You need to consider in what format your foto camera saves the pictures during digital frame choosing, if this format is not recognized you will have to do file formats transcoding. Modern digital photo frames can display not only the image, but also to play sounds and show the videos. They use Mp3 sound file format (which we have mentioned in the article about MP3 players) for sound reproduction most often. Digital photo frames show the video mainly in mpeg-4 format. Some models also support WMA audio files format and 3Gp, MOV or AVI video files format. 6. Picture frames amount of memory. Number of images (sounds, videos) that you can place in a device depends on the amount of its memory. Frames can use both their internal and external memory. Internal memory of picture frames has a size from 128 MB to 2 GB most often. External memory can be used by connecting of digital memory cards of different formats. SD cards are most commonly used in cameras, these cards also commonly used in frames in this regard. Memory card can be easily installed in a device from the camera and, as a result, you can see all your images or videos on frame. Memory Stick Cards, MMC or others can be used in digital photo frames except SD cards. Digital frames can have also a USB port for connection of flash drives or other devices. Digital frames can have a number of additional features such as a calendar, alarm clock, Wi-Fi and other functions in addition to the main functions of viewing photos or videos. The control panel can be included in the package for easy viewing. Some of these functions are in almost all devices, but for some of them you will need to pay extra money. Now, after reviewing of the functionality of digital picture frames, you can make your choice more easily.